Source: Naval Air Pilot, 1936. Depths: 6 to 46 feet. Shelter: Protected anchorage for about 50 VP-type seaplanes is available under all conditions of wind and weather. Importance: Good advance base for the operation of about 50 VP-type seaplanes. 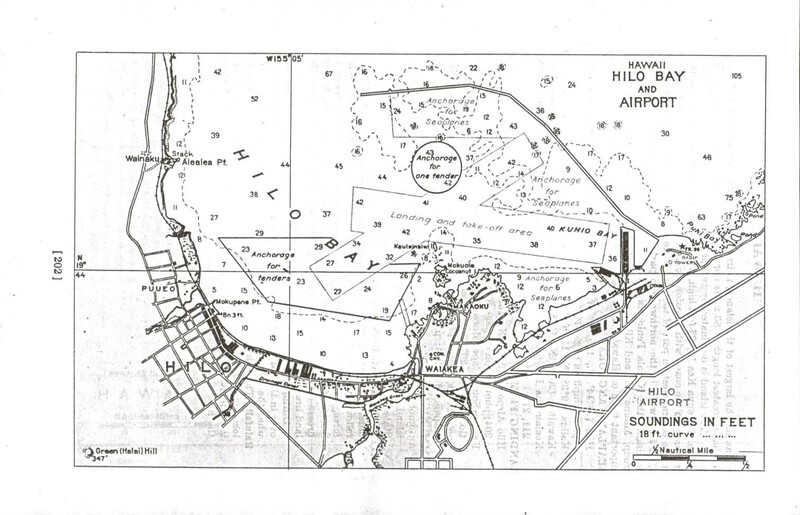 Hilo is the second in commerical importance and population of the cities of the Hawaiian Islands. Area: NE./SW., 1 mile; E./W., 1 mile. Shelter: There is sufficient room under normal full load conditions for both day and night operations. Take off under overload conditions for long distance flights is questionable. Outer bay is exposed to the northeast trades. Obstructions: Harbor buoys. Ground swells in entrance to harbor. 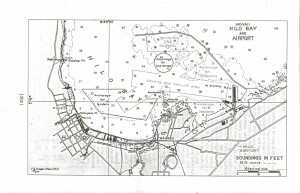 No high hills in the immediate vicinity of the harbor which itnerfere with landing and take-off. Large fleet of fishing sampans operates in the outer bay; the movements of these boats are uncertain. Limited quantities of aviation gasoline adn oil available, by ;making advance arrangements with the harbor authorities through the commandant; 14th Naval District machine shops are available where minor repairs could be made. No drydocks or large marine railways. Beach: No seaplane beach available. Plans must be serviced by boats or from a tender. Communications: Radio station, call letters KLN. United States Navy radio station, call letters, NPH inoperative. Meteorological Conditions: Practically any schedule of operations can be carried out between the first of April and the middle of November. Between the middle of November and the end of March, frequent interruptions or delays in aircraft operation schedules may be expected; these delays normally should not last more than 2 or 3 days.